I’ll admit it. When the Wilson family sold out to Gaylon Lawrence Sr. and Jr. in 2011, I was skeptical. And worried. Lee Wilson & Company was as much a fixture in our little corner of Northeast Arkansas as the Mississippi River. Before my Daddy started farming, he worked as an accountant for Lee Wilson & Company. We lived in Wilson, Arkansas on tree-shaded Washington Street. How could a total stranger just waltz in and buy up one of our towns? Our cutest town. The town where my high school team played football on Friday nights while I cheered from the sidelines. Well it happened alright to the tune of $150 million. And so far, from what I’ve seen (and I’ve seen the chocolate chess pie at the Wilson Cafe) the change is a very tasty thing. The Wilson Cafe (at the former Tavern location which still holds a sweet spot in my heart) is serving up marvelous homestyle food like 3-inch thick meatloaf smothered in cream gravy with sweet potato pie for dessert. And it isn’t just the food that has me blogging. The entire experience was a treat—clean, understated decor, walls lined with original paintings from local artist Norwood Creech, attentive wait staff willing to move us three times as our group continued to grow… Really, for a moment, I forgot I was home in the Delta. Over one hundred years ago, Robert E. Lee Wilson created a vast empire from Mississippi Delta swampland. The effects of his vision have been far-reaching, affecting the entire region and country, affecting me. Change is often unsettling and difficult, yet Lawrence appears to be enhancing Mr. Wilson’s original vision, breathing life back into the charming town. And he’s only just begun. Additional plans including a private charter school and relocation of the Hampson Archeological Museum which houses a huge collection of pre-Columbian artifacts. For the first time in a long time, Wilson is attracting first-time visitors, but perhaps more importantly, Wilson is bringing people back home. Talya you are a very taleneted writer. Looking foward to reading your book. And I’m with you about the Tavernand also Wilson. Keep up the great writing. Thank you so much Gene! I appreciate it. Just think how nice it is to live in Wilson 365 days a year! The Wilson family always will be remembered as a great family and we were all alittle concerned when they sold EVEYTHING! But Mr. Gaylon Lawrence has taken us under wing and is doing good things for our little corner of Mississippi County, Arkansas. You all have an open invitation to come and visit. I’m so glad you had the opportunity and the pleasure of eating at the cafe! Hope to see more of your writings in the near future! Thanks Jimmy! Yes, the cafe was wonderful! 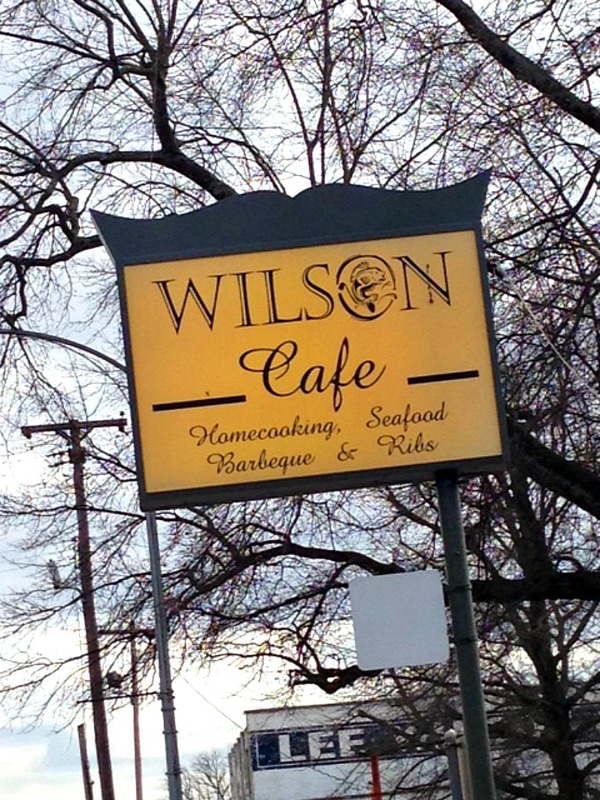 I look forward to eating at the Wilson Café the next time I go “home” to Tyronza. I also live in the Dallas area and reading your blog is like a visit home. Hi Talya Next time I come to Wilson I will stop by and check them out. I was born and raised in Wilson ,all my childhood memories are of Wilson. I also knew some Tates from around Victoria,and Thomas Tate was one of my very good friends,when I worked for John Deere,I knew so many people. I moved to Texas in 1985 and love it,I live in Grapevine next to the DFW airport. Enjoyed our visit,hope to see you soon. Enjoyed seeing you too Leila! Every time I visit your blog I know i’m gonna leave with a smile on my face and feel that I was fed blog wise. I dearly enjoyed the post like always. Thank you so much. What a nice thing to say. A great piece of writing. Every success to Gaylon Lawrence Sr. & Jr. in preserving the history while moving forward to improve the town. Good post. You made me want to visit Wilson. Isn’t it great that the Lawrence family caught the vision? Tayla, I cannot wait to visit The Wilson Cafe. Enjoyed your writing. Thank you so much Danny. Talya I was in Osceola last Thanksgiving,and I was headed out to Keiser to visit my brother,and as I past Thomas Tates house I didn’t see the Corvette that set under the carport for many many years.Do you have any idea what I am talking about? Gary – You know I’m Thomas Tate’s daughter, right?? Momma sold the yellow corvette years ago to a friend in Memphis who completely restored it. He sold it just a couple of years ago. Also, with respect to your prior comment, Junior Tate of Victoria, was my uncle:)) Thanks for reading and commenting. Hi again, I liked your FB page. If you have a chance, check out my FB page, Existential Eater, and website: http://www.existentialeater.com. Thanks! Going there now. Thank you! Don’t know how I missed this last year. Loved the blog, and you know I love Wilson. You really captured some great pictures of The Cafe. I really enjoyed all the comments.